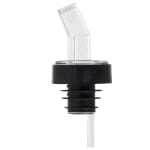 This Tablecraft Screen'Em black collar free flow pourer with a clear spout is a great way to keep your bottles extra clean and prevent pests and debris from getting inside because of the sanitary screen at the end of the spout. This black collar pourer is free flowing to give you complete control of how much liquid you want to pour. The construction of the clear spout allows you to easily see the quality of your liquids before they leave the bottle. This free flow pourer keeps your liquids safe and increases inspector satisfaction! Screen'Em Pourer, clear spout, black collar, free flow w/sanitary screen. "Screened pourer is great to keep out bugs. Makes Health Department very happy."